Spin 3D Mesh Converter is one of the most stable, easy-to-use, and comprehensive 3D mesh converters available. We make this 3D mesh converter free in the hope you will like it so much you will try our other graphics or file conversion software. Download for free today and get started converting in just minutes! Spin 3D converts between STL, 3DS, 3DP, 3MF, OBJ and PLY mesh file formats. No matter which program you use to create your 3D models and 3D designs, you can convert to your desired output format. Convert your 3D design to STL for 3D printing with Spin 3D. 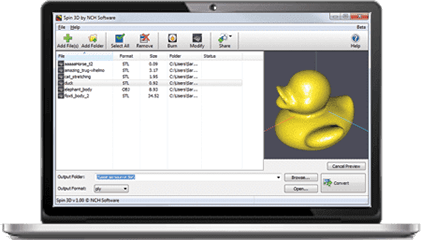 Convert your 3D model to the format required by a video game or your 3D editing software. Share a 3D object with a client in their required format. Preview original 3D files and the output results prior to converting your file. Ensure that you are working with the right file and that the output is accurate. 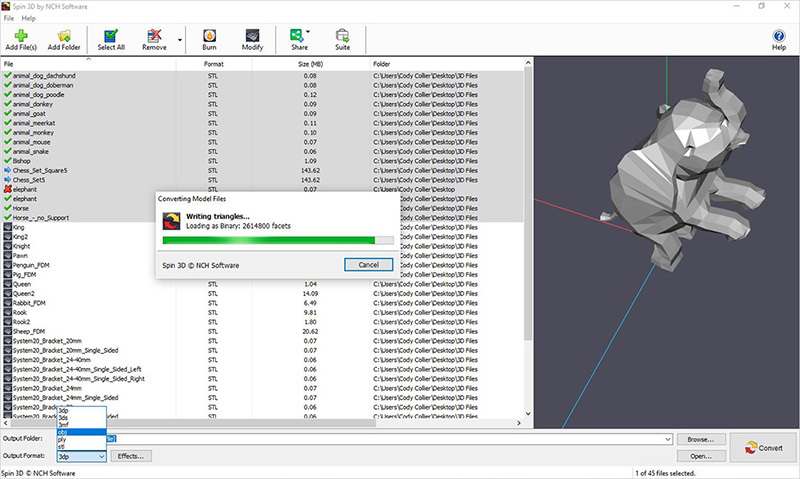 Spin 3D features multi-threaded batch processing. Whether you are converting one file or many, the conversion will take place efficiently using the best technology. Convert videos between over 30 popular formats with Prism Video Converter. Convert, compress, resize and rotate image files with Pixillion Image Converter. Convert, compress and encode sound, audio and music files with Switch Audio Converter. No matter which program you use to create your 3D models and 3D designs, you can convert to your desired output format. Spin 3D quickly converts 3D designs into STL files for 3D printing. Cut and slice 3D models from the web or of your own design into print-ready STL files for your 3D printer." document.getElementById('gamemodding').innerHTML+="